The world’s conscience was touched by the photo of a toddler who drowned while fleeing the war in Syria — and Europe’s cohesion is threatened by the growing flood of Syrian refugees. But Western leaders won’t let go of their “regime change” fixation which is making matters worse, writes Rick Sterling. Around 3:30 a.m. on Sept. 2, toddler Aylan Kurdi, his brother, mother and nine others drowned trying to reach a Greek island from Bodrum, Turkey. Around 6 a.m., the staff photographer from Dogan News Agency came upon Aylan’s body on the beach and took the famous photograph of the little boy lying face down on a beach. Media worldwide began featuring video and stories showing refugees traveling by land in Europe. The crisis that burst into view on Sept. 2 has been building for years. But can the raised consciousness address the root cause of the crisis? –Syrian refugees accepted in Europe and other Western nations are a small part of the total need. There are 4 million Syrian refugees living in bordering countries and another 7 million to 8 million displaced Syrians living in government controlled areas within Syria. Most Syrians just want the war in their country to end. Two days after his children and wife drowned, on his way back to his hometown of Kobane Syria, the father of Aylan Kurdi said simply, “All I want is peace in Syria.” But the forces driving the war are not changing their approach. Since Aylan’s death, the countries waging war on Syria through proxy armies continue to demand change in Syria’s government and/or direct intervention through the sweet-sounding name “secure zone” (which would mean in reality a military invasion by the U.S. and/or other countries to seize and control Syrian territory from which rebel forces could strike deeper into Syria). –On Sept. 4, Turkish Prime Minister Davutoglu said “I have been trying … to persuade world leaders for the need of the establishment of a secure zone inside Syria. … There are developments just like the ones occurred in Srebrenica if secure zones are not established.” His comparison to Srebrenica hints at the beginning of potential NATO bombing and is ironic since Srebrenica had been declared a “safe zone” years before the city became a symbol of death and war. General Allen talks easily about “long term struggle” while Syrians have their country attacked by foreign-funded mercenaries and fanatics. The total population of Syria is less than 10 percent the population of the U.S. yet more Syrian soldiers have died defending their country than all the U.S. soldiers killed in Vietnam. What would General Allen think if the U.S. was being invaded by tens of thousands of heavily armed and financed terrorists streaming across the Canadian and Mexican borders? There are many “non-governmental organizations” (NGOs) working on Syria. The “White Helmets” is such an organization, created by the U.S. and UK with training in Turkey. They claim to be “neutral” but are not. They posted an illustration of Aylan Kurdi linking to an article calling for an “aerial bombardment free zone” in southern Syria. They effectively used Aylan’s death to promote a U.S.- or NATO-enforced No Fly Zone (which in real terms would require U.S./NATO war planes to destroy the Syrian air force and anti-aircraft sites). “Barrel bombs” are just home-made bombs of less cost and power, especially compared with U.S.-manufactured bombs supplied to Saudi Arabia and Israel (which have included cluster munitions notorious for indiscriminate killing). “Barrel bombs” fall to earth by gravity so people on the ground can avoid them more easily than guided bombs. People on the ground also can monitor overhead aircraft and find shelter if there is risk of a falling “barrel bomb,” whereas the self-propelled “smart bombs” can strike without any warning blowing apart not only the target but innocent bystanders. Roth also ignored the support of proxy armies by the U.S. and its allies, such as Turkey and Saudi Arabia; he also ignored or trivialized the sectarian and fanatic ideology of the armed opposition. According to Roth’s analysis, the core problem is Assad government attacks on civilians. In reality, however, there are few civilians in the areas controlled by the violent opposition. In the recent Syrian government attack on the violent opposition in Douma, for example, it is claimed the attack was on civilians in a vegetable market place. As shown in this investigation, the fatalities were almost all young fighting age males, a curious demographic for a vegetable market. The characterization of the Syria conflict by western NGOs and neocons is simple: the problem is the evil Assad. Although it is true the Syrian government needs reform, laying blame for the Syrian war at its feet is simplistic and inaccurate. By demonizing the Syrian government, Human Rights Watch is undermining the chance for compromise and negotiation. Shouldn’t an organization truly committed to human rights be working for a Syrian resolution of the conflict rather than promoting more foreign intervention and prolonging the war? The death of Aylan Kurdi highlighted the desperate situation of refugees in Turkey. Many believe Turkey has recently been “looking the other way” as refugees take the risky departure trip. The Turkish government may be trying to get rid of the refugees and pressure Europe to commit more resources to the war against Syria. Meanwhile, Turkey’s ruling Justice and Development Party (AKP), closely allied with the Muslim Brotherhood, lost its parliamentary majority in the June election. Unwilling to form a coalition government, the party has forced a second election to take place Nov. 1. The stakes and tensions inside Turkey are high and rising. President Recep Tayyip Erdogan seems to be going for broke and provoking tensions, nationalism and conflict with the opposition. On July 20 in the Turkish town of Suruc, across the border from Kobane, Syria, 32 Turkish Kurdish youth were killed in a bombing. The Kurdish Workers Party PKK claims that Turkish intelligence was behind the bombing, a credible accusation since there is strong evidence of Turkish intelligence support for Nusra, ISIS and other terror groups operating in Syria. –The “Army of Conquest” (Nusra/Al Queda, Arar al Sham, Chinese Uighur, etc.) overran the Abu Duhour Air Base and killed about 100 Syrian soldiers. –The Syrian Army beat back a large ISIS attack on the important air base in Deir Ezzor in eastern Syria. Living conditions inside Syria are difficult in many areas, with rationing of electricity and running water. Some Syrians have grown tired of waiting for peace and decided to flee for a chance at security and a better life. Others bravely or stoically continue to make the best of the difficult situation. The war in Syria is intense and bloody. The death toll is huge. 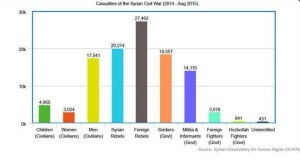 The Syrian Observatory for Human Rights, which supports the opposition, recently produced a graph showing casualties over the past year and half. 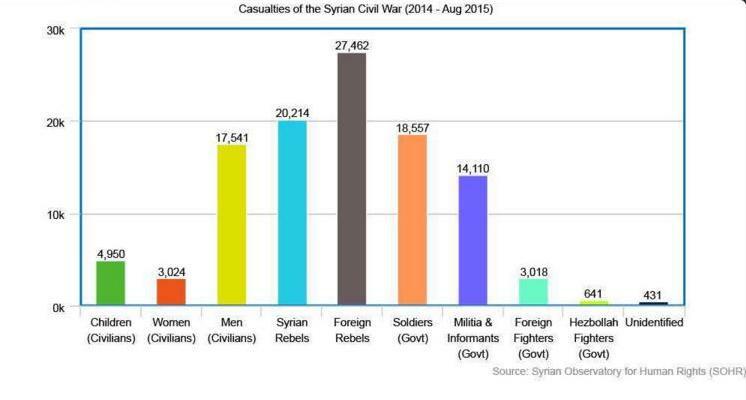 As can been seen, the largest number of fatalities are foreign fighters. So, why is this called a “civil war”? Many people are shocked at the images of Aylan Kurdi or thousands of refugees struggling to reach safety somewhere. Some say: “We have to do something!” The reality is that the U.S. and its allies have been “doing something” in Syria since 2011. The U.S. and NATO countries plus wealthy Gulf states and others have been funding, training, providing weapons and salaries for tens of thousands of mercenaries and fanatics to attack Syria. This is a clear violation of customary international law and the UN Charter. A solution to the Syrian refugee crisis is possible. It would involve outside powers giving up their demand for “regime change” and stopping their support, training and funding of violent opposition groups. There could be an internationally enforced agreement with guarantees for the right to peacefully protest and elections. What is needed is to stop the violence and allow for the start of reconciliation and rebuilding without preconditions. Is that possible? Are the U.S., Gulf monarchies and NATO so stubbornly committed to their regime change agenda for Syria that they will inflict hundreds of thousands more deaths and further destruction on the cradle of civilization? Meanwhile, the tragedy continues. Twenty-two refugees drowned this week trying to reach Greece from Turkey. What has changed since little Aylan drowned? Many more people are aware of a refugee problem. Some countries are taking in more refugees. But the root cause has not been addressed. The war of aggression against Syria continues. Rick Sterling is a freelance researcher/writer and founding member of Syria Solidarity Movement.